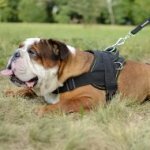 English Bulldog leather collar is a functional attribute for outside everyday activities of your dog. There are collars of one and two leather layers. 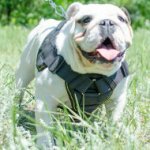 What kind of dog collar is best for your adorable Bully? The collar of one-ply leather is a classic model, which is used for walks and training. Full grain natural leather is well-processed, oiled and carefully treated along the edges. 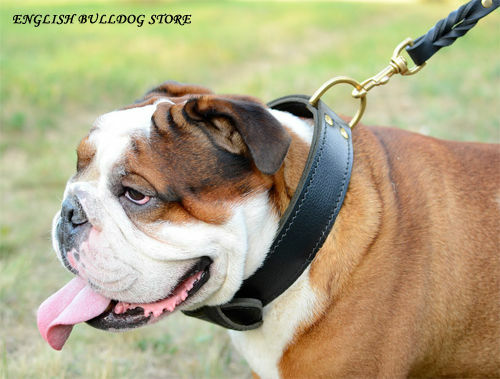 The material is soft, elastic, but doesn't allow Bulldog to slip out of the collar. Leather is 100% safe. It won't cause any skin problems, rubbing or cutting into the skin of your Bulldog. Moreover, there are no machine stitches to make the accessory maximum comfy. Leather strap is wear-proof and tear-resistant at the same time. 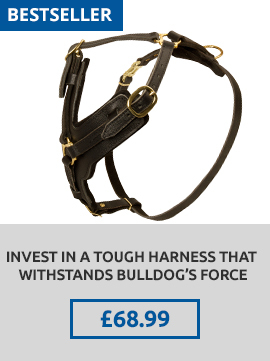 Leather width and thickness are optimal to control the dog with confidence using this collar. 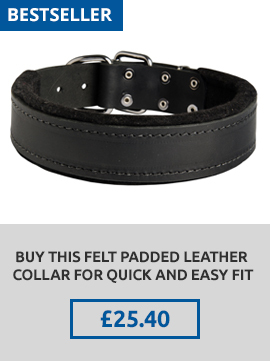 This collar is suitable for medium and large Bulldogs. 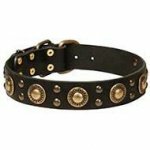 It is easily adjustable with the help of traditional buckle and 5 holes on the collar. There is an option of color choosing among black, brown or beige. 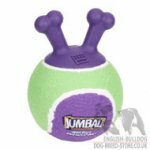 This item will serve your Bulldog for a long time and will become an indispensible attribute for daily use. 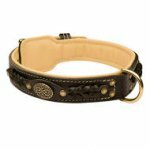 2-ply leather dog collar is double extra strong. 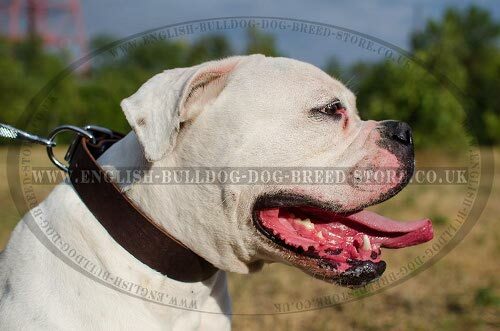 It is wide, heavy and used for powerful Bulldogs of middle and big sizes. Leather layers are accurately stitched together for additional durability. The collar won't tear even at heaviest loads. Both leather straps are manually worked out, greased and the edges of the collar are polished. The collar is pleasant to wear in spite of its massiveness and won't rub or irritate dog's skin. Leather contains no toxicants and is hypoallergic. 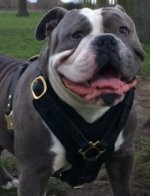 There is a fur saver plate of leather on the inside of the buckle to protect Bulldog's coat from damage. 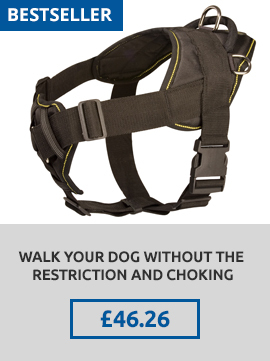 You can regulate the size of the collar through 5 inlets and a standard buckle. 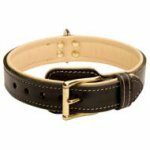 An option of black or brown color of the collar is available. 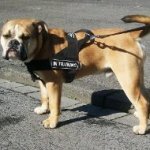 The collar is perfect for strong Bulldog control during walking and training and also for agitation work. 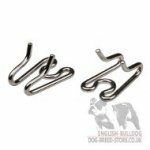 Both collars are hard-wearing, suitable for Bulldog and intended for long-term use. Which one to get depends on your needs.